Forestry is second only to agriculture in European land-use. In this International Year of Forests, woodland covers 42% of the EU and is increasing in many countries. Woodland has important potential for locking away carbon, for example in buildings and furniture. Foresters in Germany were also the originators of the term ‘sustainable use’. However, intensive forestry can reduce the riches of nature. 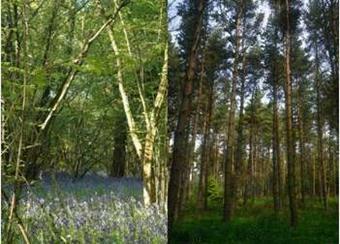 Creating and managing woodland is on a longer time-scale than farming, because woodland crops take decades to mature. This makes predictions of climate important, and also means that problems with pests can destroy years of effort. What are the forestry equivalents of conservation headlands and beetle banks that aid conservation and pest management in farming? Local communities can depend on woodland for practical resources (such as fungi, berries, firewood and game), for shelter effects and for other amenities. This interest can benefit woodland management, but also brings responsibilities for social and wildlife management especially when crops are harvested. BEST PRACTICE. Ideas for encouraging older woods and appreciating non-timber value. PRODUCTION. Knowledge about trees is so important that a start has already been made on decision support tools for forestry. Naturalliance sees opportunity to make forests more productive for owners, local people and society as a whole. PROBLEM-SOLVING. We have much information to gather to help manage species that damage woodland. MAPPING. Foresters have pioneered the use of habitat mapping for their woodland management. Naturalliance wants to encourage use of the best systems. • Benefit from the recreational use of your land and its other services to society.